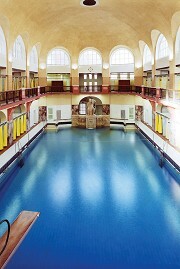 The Elisabeth- Schwimmhalle represents the art nouveau style and was built in the early 20th century, situtated close to the Aachen cathedral. Originally intended as a full featured spa, the bath house included in its early years a sauna and a section with bath tubs. The sauna section was abandoned early and until now it serves the musical theatre Aachen as administration and rehearsal rooms. 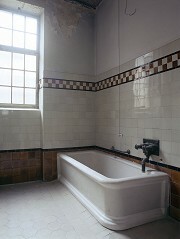 The bathtubs were in use until the 1990s and most of the fittings and tubs are still well-preserved. This section of the bath is now used as a storage space. 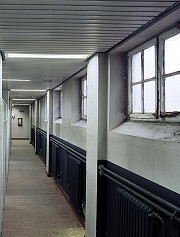 It was a main target to increase the fire protection standards of the building. In addition to that, the damaged parts of the house were renovated and a better thermal protection was installed. It was my task to document with my photography the whole restoration process, including the construction works as well as the necessary repairs.